Visitors and guests are welcome to visit our church at Sunday's worship service. Come as you are and make a few new friends. We are a unique church. Rather than hear sermons from the same settled minister each Sunday, we have chosen to open our pulpit to ministers, community leaders, intellectuals, and free thinkers from a variety of faith backgrounds. On any given Sunday, you may here from a professor, a meditation guru, an Episcopalian minister, or leaders of Los Angeles social justice organizations. 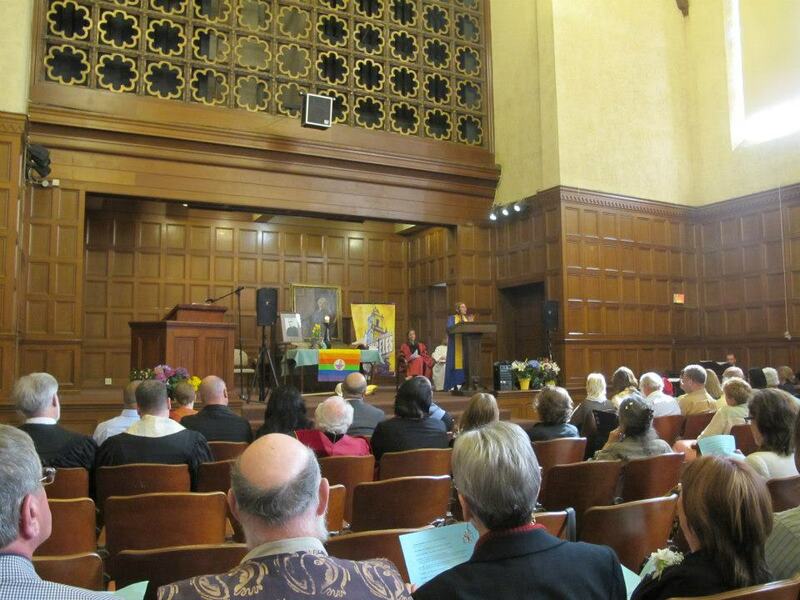 We find that hearing from people from many different backgrounds, all of whom share our Unitarian Universalist values, best upholds our commitment to the free and responsible search for truth and meaning. When you enter, most likely you'll be greeted by a volunteer, offering you a paper name tag and an order of service. (The order of service is like a program for a concert—it lists what’s happening in the service). It’s fine if you wish to chat with the greeters, or to slip by quietly to find a seat. Our worship spaces have open seating. Find a place that feels comfortable. There is no need to know anything about Unitarian Universalism before you visit. We welcome people of all faith backgrounds. If you'd like to learn more about the UU faith, this page will be helpful. We like to sing a few songs. You’ll often find a hymnal—a book of songs and readings for worship—at the welcome table. The speaker will tell you which song we will sing. ("Please rise, as you are able, for the first hymn, number 123"). If there's a reading the congregation will say together, you'll be told where it's printed out. We welcome all voices but you are not required to sing. Wear what you please. You may see people in skirts and collared shirts but most people wear shorts and jeans. We offer real-time translation for our Spanish speaking guests. We also include a few Spanish language songs in our service. Following the service, there is a casual gathering where members and visitors can get to know one another over lunch. This can be an excellent time for newcomers to make connections and learn more about the congregation and Unitarian Universalism in an informal atmosphere. Look for the "Visitors" table at lunch where members of our Welcome Committee are available to answer all of your questions. Our parking lot is underground next to the church. Look for the sign that says "Church Parking." Street parking is also available. We are also just a short walk from the Wilshire/Vermont Metro Station.